In my first year at Harvard, I vacillated between feeling I was a Greek shipping scion and a penniless writer, and the fact is, I was both. My cousin [Michael, Uncle Manuel’s son], who had been a senior at Exeter when I visited him, was a senior at Harvard when I was a freshman. He breezed into our freshman dorm on registration day and regaled us with stories of the South of France where he had spent the summer. He drove a Mercedes 300 SL, the kind with the doors that opened overhead so that you got into the car as though into the cockpit of a plane. He had a personality to go with the car, leaving it with two wheels up on the venerable cobblestones outside Adams House to collect parking tickets. The next summer he totalled the car on the Haute Corniche above Monte Carlo; but the mishap only seemed to increase his stature in the family’s eyes, and soon the Mercedes was replaced by a Ferrari. I asked for a car to take to college. My father said he would give me one, but he didn’t say what kind it would be. He knew me well enough to know I wasn’t after a Mercedes or a Ferrari. I wanted something conventional and inconspicuous, a Ford or a Chevrolet convertible. But as I was packing to go to Harvard for freshman orientation week, wondering when and if my car would appear, my father told me I could take my mother’s old Cadillac. Heads turned as a yellow Coupe de Ville with a black hardtop roof sailed into Harvard Yard on registration day, the only day cars were allowed into the Yard so the freshmen could unload their books and furniture. It was a 1950 model, so in the fall of 1955, it was a little long in the tooth. But I did not object to its age. 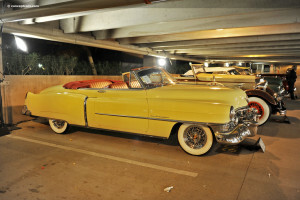 I would have taken a 1950 Ford or Chevrolet, a 1950 anything as long as it kept its tail fins down. But my car’s went up like Elvis Presley’s ducktail. A few years later, the Beatles would have written a song about it.